Called the Niagara Falls of South India, for a view of waterfalls, breathtaking scenery and freshly cooked fish, visit Hogenakkal Falls. Monsoons and waterfalls make for a perfect combination. And now that the monsoons are getting here, it’s time to pack up your picnic bags and gear yourself up for a drive 130 kilometres south of Bangalore over to Dharmapuri district in Tamil Nadu. Why? To check out the splendid Hogenakkal Falls. 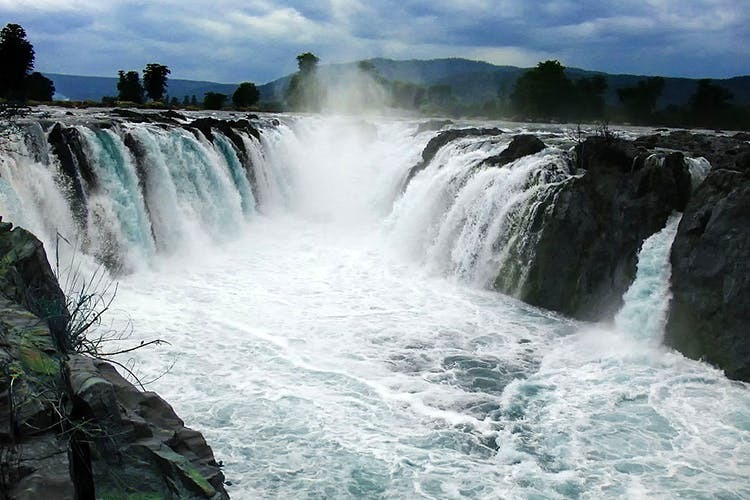 Watch the forceful water come crashing down a series of rugged rocks that are said to be one of the oldest in South Asia, and enjoy the unique sight and the sound of the waterfalls. You could take your entire fam and make a day out of it. However, its probably a good idea to go on a weekday to avoid large noisy crowds and get some serene in. The entire place with its rustic village charm makes for quite an escapade so be sure to tick it off your list of things to do in and around Bangalore. You could take a dip at the deep ravines where the water flows through, and here’s a myth: the water is said to have medicinal qualities. However, this entire experience could be extremely dangerous, so please ensure your safety. Occasionally, there are coracle rides offered which is for those of you looking for a slice of adventure. Be warned that naked men getting oil massages by the Hanging Bridge could disrupt your view of the mesmerising falls, but for a better view and INR 10, you could head to the watch tower at a small height which offers quite a view. The mighty mountain scenery surrounding the falls makes it picture perfect. You could also sample and enjoy some of the fresh local catch of fishes at the market stalls at the edge of the falls. A paradise for all you seafood lovers.